It is recommended that you always select the Show All Chemicals option on the report Parameters page when running a report for demonstrating local or federal regulatory compliance. Do not select the Show Chemicals > 1% and EHS > 0.1% by weight option unless you have confirmation from your state regulatory agency that you are allowed to do so. ERA recommends you always select “Show All Chemicals” (as shown above) for your air emissions reports unless your state environmental agency states otherwise. That’s because some states do not allow reporters to utilize the De minimis exemption when reporting for HAPs or VOCs. You should always check beforehand with your state regulatory agency if you have the option of not reporting chemicals below the De minimis threshold. 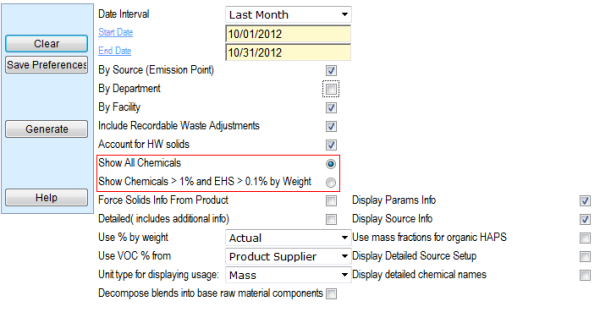 It is important to note that the De minimis percentages used for other federal or state reports, like annual Toxics Release Inventory reporting, may differ from those used in chemical/finishing air emission reports. If your particular state does allow for the De minimis exemption, you have the choice to run the report using the “Show Chemicals > 1% and EHS > 0.1% by weight” for demonstrating your compliance. Using this option, the report will only calculate emissions from your product components, regardless of the calculation settings in your application system setups. For example, even if your source is set to calculate VOC from Vendor Values, selecting the De minimis when processing will only calculate VOC from component values in order to check each chemical against the De minimis. Only chemicals that exist in a material at levels above the De minimis threshold will contribute to emission calculations (for example, air emissions would not be reported for formaldehyde existing at 0.07% by weight in a specific material). This will likely reduce the amount of air emissions contained in the report. It is always best to check with your state regulators before submitting any compliance report in order to protect your compliance history and avoid environmental fines. You can find a directory of State Environmental Agencies online here. If you have questions or concerns about using the De minimis exemption or any ERA-EMS report, please do not hesitate to contact an ERA environmental specialist for support.